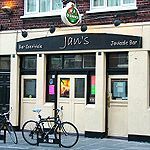 Stoke Newington's Jan's Bar is a few minutes' walk from Church Street and specialises in Belgian beer. Entertainment at Jan's Bar comes in the form of live jazz music on the last Sunday of every month. Do you work at Jan's Bar? What did you think of Jan's Bar? A Flemish-style neighbourhood bar run by a beer expert, Jan’s offers a range of Belgian beers by the bottle or on tap, as well as putting on free live jazz in the evenings. Jan’s is one of the lesser-known bars in Stoke Newington, perhaps because it’s not on the main drag of the high street or Church Street. But it’s easy enough to find. Walk north up the high street, past the Jolly Butchers, and turn right at Abney Park Cemetery gates. Northwold Road cuts through Stoke Newington Common, but the bar is just a minute or two away from the high street. Though it might not look like much from the outside, indoors sits a large ground floor bar with plenty of leather sofas and round bar tables for drinkers to settle in for the night. Old tube signs hang on the walls overlooking the tables, and the landlord lights an open fire in the winter months. At the back of the bar a door opens onto an outdoor yard for smokers, with a little bench and table. Keeping the old pub-style setting (Jan’s was The Cricketers until 2008), it feels more like a European local than a north London bar. Unlike the bustling pubs that Stoke Newington is best known for, Jan’s is a quiet bar with candlelight and that open fire in the colder months, attended by an older crowd than neighbouring venues. The landlord puts on free live jazz at weekends and after the bands pack up, jazz or West African music pumps through the stereo. Unfortunately, there’s no food available at Jan’s, but it makes a good drinks venue if you’re hoping to get a table and talk. Almost every beer behind the counter – on tap or bottled – is of Belgian origin, making Jan’s one of the best places for fans of Trappist ales. Most customers will be familiar with brewers such as Leffe, and some will recognise Duvel and the red, white or blue labels of Chimay beer, but Jan’s also stocks abbey beer Grimbergen, Westmalle and Tripel Karmeliet besides a range of other European names. The selection of fruit beers is good too, and for adventurous types, a sour lambic beer (such as Mort Subite or Rodenbach) makes a change from your average pint. Not sure what to drink? The staff are passionate about Belgian beer and the landlord in particular takes pleasure in divining which tipple would best suit a palate - or even a mood. Beers don't come cheap, but it’s rare to find such a good selection. Beers on tap tend to stand around the £4-£5 mark (half measures are available), and most bottles cost £5 or more. Non-beer drinkers can sink a glass of red or white wine, and there is a small range of spirits available as an alternative. Jan’s unrivalled range of Belgian brands makes this bar a must-visit for locals. It’s a quiet spot, but a sweet change to the hustle and bustle of Stoke Newington High Street, perfect for catching up over a great beer.